You spent a fortune laying down tile, marble, bamboo, or hardwood flooring in your home so you don’t want to blow it and etch a nice big scratch or dent in your expensive hard surfaces. Imagine if your living room had a deep mark where the ottoman scraped by – that would totally haunt you every time you walked by. 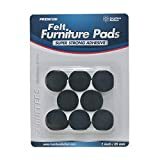 Just one Jumbo Pack can save the day with a variety of 8 different felt pads for furniture. Let’s face it, our chair and table legs come in all different sizes and so unless we have a kitchen or dining room set where just one inch separators work, it’s usually not a one size fits all world. When it comes to the heavy stuff like couches, chests, and beds, you’re going to need a variety of different sizes – and larger ones at that – to get adequate coverage and protection. Hence, for full blown home protection projects you need a Jumbo Pack but if you’re just padding a dining room set, a standard size 24 pack as seen in the YouTube video below will work beautifully. The most common search for home decorators is where to find furniture pads to protect hardwood floors which makes sense because wood extremely susceptible to scratches, marks, and indentations and yet is very costly to both install, repair, and replace. For a high quality felt pad that you can trust rely on, Furniture Buffers sets the standard in safeguarding floors and hard surfaces. Their non scratch felts stop noise pollution from chairs as well as the scraping that the chairs cause . Of course, Buffers you also prevent the denting and scarring that can come from sofa and table legs resting directly on hard surfaces over time. One critical differentiation is the ultra compressed felt factor. Furniture Buffers are super soft but extremely firm because the felt is compressed so tightly. This means the layer of cushion that separates your floor from your furnishings is power lifter strong while remaining angel soft against your delicate flooring. Another difference is the super sticky self adhesive. 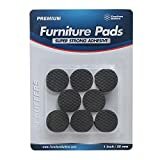 When you’re attaching non-nail pads to the bottom of chair and table legs, sticky adhesive means everything because otherwise the guards fall off and stop protecting. Stickiness keeps each piece on and thus is the single major difference between premium and average pads. Moreover, with Buffers stick-on pads, you can decently slide your furniture, meaning you have a “medium-slide” capability. You won’t get the full sliding effect with the sliders that are made specifically for gliding across tile or other smooth flooring but if you need to push a table across the room, you can do it. This sliding feature also comes in handy when you just want to kick your chair out from under the table. If you’re looking for a product to cushion, separate, and absorb shock and vibration, try FB’s non-slip pads. And we’re sure you can think of other uses around the house. There really are a lot of things that could really use cushioning. The beauty of it all is both the felt and rubber-foam “feet” are sleek, discreet, and virtually unnoticeable. Each pad is a true dark black color which allows them to hide in the shadows while furniture, decor, and surfaces all stay separated, cushioned, and ultimately protected. Given the low cost to safeguard your home and your property, it’s a great idea to buy a Jumbo Pack and 1-2 packs of the non-slip pads, put them to use where you need protection, and then toss the rest in the closet until you need them later. And you might not think it but the Furniture Buffers brand is a little bit like Sears Roebuck Craftsman tool line. Yes, Craftsman was a maker of heavy metal tools and Furniture Buffers is soft, cushiony furniture pads but both brands represent high quality and offer a lifetime guarantee for their product. That’s why each is a benchmark in their respective niches and why both believe they offer the best product value anywhere. Cushion and protect now because it’s a lot easier and cheaper that way. You’ll have peace of mind knowing everything is safeguarded and your floors (and other surfaces) will thank you.